I meant to hare about this a long time ago, but I didn't. When we moved here (11 months ago) I kind of went crazy on painting furniture. You saw a few things in the tour of Finley's room--and the only piece I took pictures of was the dresser. It's somewhat interesting, so here we go! 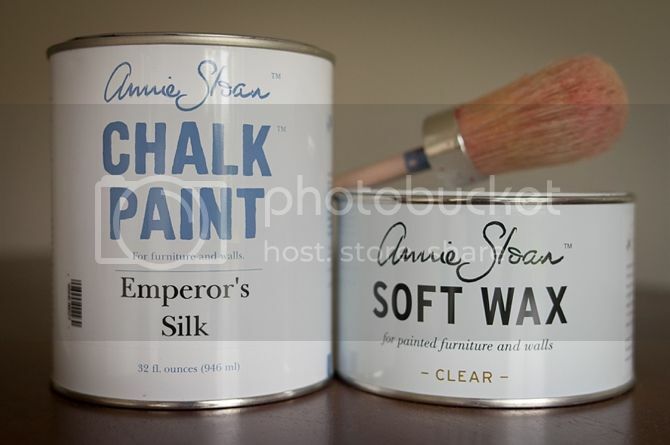 Annie Sloan was my paint of choice. It's a type of chalk paint--which means if you don't finish it with the wax, you can use it as a chalkboard. 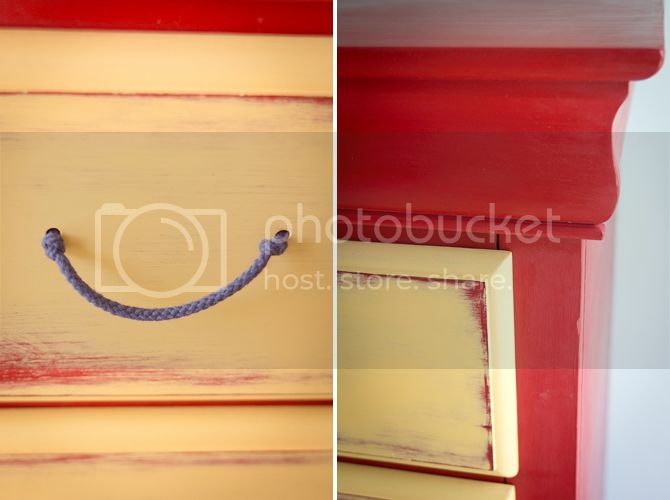 Chalk paint is amazing--it goes on almost any surface with almost no prep. Just wipe with a damp rag to get all the dust off! It's kind of a pricey paint, but a little goes a long way and its cheaper than buying new furniture. 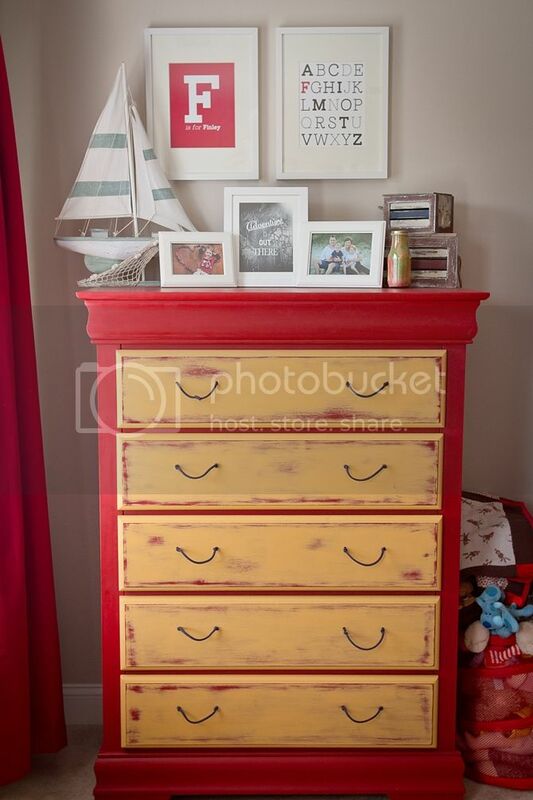 We'd had this dresser since we got married and it's fine--but Finley insisted on having red walls when we moved here... so painting his furniture red was a great compromise! After removing the hardware I painted the whole thing red (or Emperor's Silk). They say you only need one coat, but I definitely needed two to get it the color I wanted. I put two coats of yellow (Arles) on the faces of the drawers then lightly sanded to distress it and let some of the red poke through. I actually sanded the whole thing, but went heavier on the yellow. After sanding, I did the "wax on, wax off" process to seal the paint... and it was done! I'm still not entirely sold on the drawer pulls--but it was a cheap, cute solution until I find something I like better! I really love the dresser--and Finley tolerates the fact that there's some yellow on it. You can see Finley's whole room here. I haven't painted anything in months and still really want to paint everything in the house. Braden scribbled on my desk, so it needs to be touched up. I'm really trying to hold myself back. It's just so fun to slap a fresh coat of paint on something and turn it into a piece you love! This is excellently timed for me! 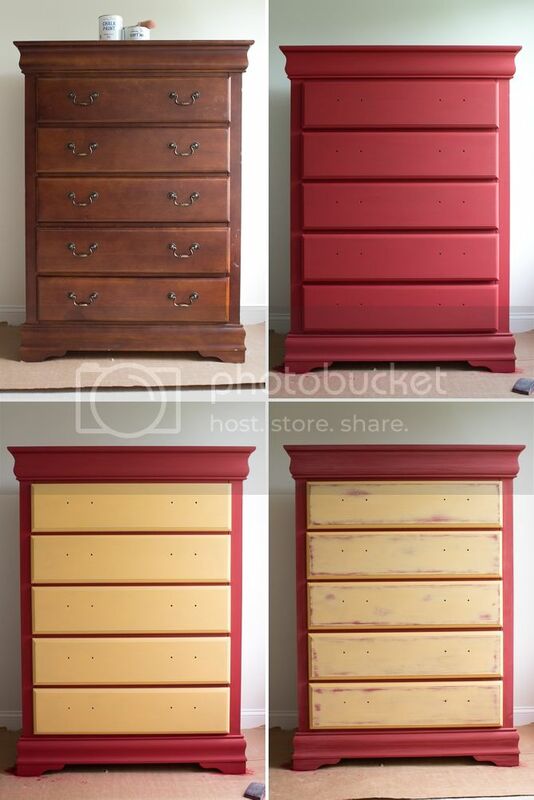 I was just researching chalk paint as a possible solution to some furniture that needs updating. I'm curious - was one quart enough for the dresser? Was there much left over? I don't completely remember---but I think I did the bunk beds and dresser with two quarts. I think it totally depends on what look you are going for too. I wanted a really strong red and probably could have done one less coat!